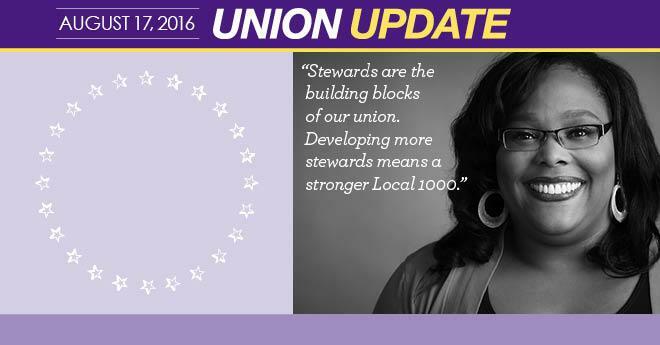 Local 1000 stewards are our colleagues who have stepped up to become advocates at the workplace. They amplify our voices and connect our members’ power across the state. Each steward is a dedicated Local 1000 member who invests their time and effort to represent our members and to build unity and strength at the workplace. Through their efforts and leadership, we have the power necessary to give our members – and all Californians – the opportunity to have a good life. The Leadership Apprentice Program for Stewards (LAPS) gives our stewards the tools they need to succeed. LAPS is a six-month program in which steward candidates take extensive online courses, interactive in-person trainings and have access to mentorship opportunities. LAPS trains our stewards to better enforce our contract, organize their workplace and keep members connected to our union. Because of their training, stewards are better equipped to organize their worksite, better enforce the contract and make meaningful change in their community. Upon completion of the program, stewards are certified to represent members at the worksite and take an oath to uphold the steward purpose statement and our union principles.